Authors: Nicole Ackerman, et al. What can be done to help mitigate these barriers, and to push for true equity and inclusion in astronomy? This best practices guide, a joint publication by LGBT+ Physicists and the American Astronomical Society (AAS) Committee for Sexual and Gender Minorities in Astronomy, lists plenty of ways that we can start. In this Astrobite I’ll highlight some parts of the guide that I thought were relevant for undergraduate and graduate students. It’s worth noting that this Astrobite is really just a cursory summary, and I strongly recommend you check out the full guide (it’s a quick read! ), or at least take a look at the one-page executive summary (page vii of the guide, which is also the source of the excellent quote at the start of this post). Don’t tolerate the use of offensive language. This is always important outside the classroom, too! Even comments that may seem well-intentioned or simply uninformed can have a hurtful impact; statements like “that’s so gay” to describe something as “lame” might seem fairly harmless to some, but they can be incredibly derogatory to others. Work together to encourage equal participation in class. Make sure everyone gets a chance to speak and share ideas! In some cases, you might want to consider forming or assigning groups (for group projects, study groups, lab partners, etc.) in a way that doesn’t isolate marginalized students; i.e., put either zero or two (or more) LGBT+ people in each group. Make sure non-discrimination policies are explicitly spelled out in the syllabus. It can be disrespectful to assume someone’s pronouns (i.e., if they’re referred to with “he/him/his,” “she/her/hers,” “they/their/theirs,” or other pronouns). Identify students’ pronouns ahead of time (perhaps through a pre-course survey, so that students aren’t put under the pressure of publicly “outing” themselves to the class) and use them. Use inclusive examples in problem sets, and make sure assignments are anonymous when grading to avoid implicit bias. Monitor the climate throughout the course—make sure there’s some way for students to give anonymous feedback, like midterm surveys, or even have a feedback form that’s always open. What can you do in your department? Raise awareness. If your institution has some kind of diversity training, consider attending and encouraging your peers to join! Learn about other resources at your institution, too, like safe zones or diversity centers. See if there’s a way for you to invite LGBT+ speakers to your department, and help them meet with individuals or groups with whom they have common interests. Make the environment more welcoming. Not only is it important to make offensive language and behavior unwelcome, it’s also important to actively make department climate more inclusive. Include everyone in social events, and practice using gender-neutral and inclusive language. In particular, there are several easy ways to normalize the use of preferred pronouns. You can change your email signature (Figure 1), and state your preferred pronouns every time you introduce yourself. You can also practice referring to strangers (even in your head) by gender-neutral pronouns, which can help you get into the habit of avoiding gender assumptions! Figure 1. One way to practice normalizing preferred pronouns is to change your email signature. This is what mine looks like! Be an advocate. To go a step further, you can directly advocate for LGBT+ folks by lobbying your department for pro-LGBT+ changes. Some things you can push for include: equal representation of LGBT+ folks in leadership roles, a departmental diversity liaison or committee that can act as a listening ear and resource, and access to gender-neutral restrooms. Actively recruit LGBT+ students, and get some sort of bias training for admissions committees. 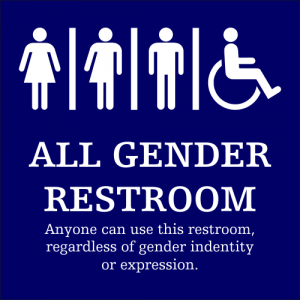 Help make gender-neutral bathrooms (Figure 2) available in your building and institution. Finally, and perhaps most importantly, be open to respectfully discussing and learning about these issues! If we can’t even talk about things that need to be improved in astronomy, we won’t be able to fix them. *Note that the term “LGBT+” covers a diverse range of sexual orientations, gender identities, and gender expressions. You can check out Appendices C and D of the guide if you want to learn more about different terms and definitions. A Study in Stereotypes: What People Think of Physicists vs. Biologists Meet the AAS Keynote Speakers: Caitlin Casey Building an Inclusive Astronomy Community Why are women leaving astronomy?